Seventy-one years later, in 2011, the City Council, by resolution 38264, declared that “[t]he City’s welfare requires an adequate supply of well-built and well-managed affordable housing serving the full range of incomes appearing among its residents.” The Council did that in response to a report it commissioned finding that the City faces “an affordable housing crisis.” In between those dates, the details of the work have changed. Financing has grown more complicated. The City’s needs and that of its residents have altered in complexity and complexion. Yet the basic challenge remains the same – to meet the housing needs of our City’s low-income residents. THA’s 75th birthday is a good chance to consider how THA understands this work and what it takes to do it. 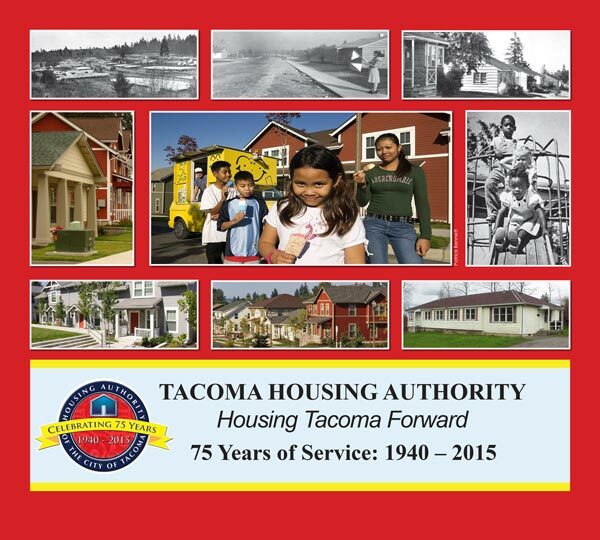 THA’s main job is to provide high-quality housing to residents of Tacoma in need, with a focus on the neediest. THA does this in three main ways. First, THA builds, buys and rebuilds housing that it then rents to households who need an affordable and safe home. It serves about 1,300 households that way. Second, THA helps other organizations develop and finance their housing to serve low-income residents. Third, THA helps another 3,700 households pay the rent on housing they lease from private landlords. All that is hard work, especially when funding is inadequate or uncertain. Yet that work is not the harder part of THA’s job. The world knows how to do that work, when it tries. The world knows how to build housing. It knows how to rebuild it. It knows how to manage and rent it. The world knows how to design and run rental-assistance programs. The world does not know nearly as much about the next part of THA’s job. This next part seeks to spend a housing dollar, not only to house people, but also to get two other things done. First, if they are capable of working, we seek to help them prosper. THA helps people succeed not just as tenants but also as “parents, students, wage earners and builders of assets.” We want their time with us to be transforming in these ways, and temporary. We want this certainly for parents, but emphatically for the children, because we do not wish them to need our housing when they grow up. The world does not quite know how to do these parts of our work. THA and its many partners try to find it out. When it works it is a very good use of a housing dollar. Understood this way, this work puts us face to face with age-old questions about poverty, the effect of place and neighborhood on a family’s prospects to escape it, and how a housing dollar can make it happen. This entangles us in questions of economic justice, racial justice, individual responsibility, community development and the appropriate role of government. We and our partners see these questions up close, and that makes this work challenging. Sometimes we see the answers, and that makes this work meaningful. THA is a board of five community volunteers appointed by our mayor. The Board directs THA’s strategic choices. It is the repository for THA’s values. THA is also a staff of about 120 people. They include our real estate development staff of project managers, tax credit and financial experts, and construction managers. Their job is to develop, build, buy and rebuild properties so they are well-built, sustainable and attractive. THA’s staff includes maintenance specialists who keep our properties in good shape. It includes property managers and leasing and occupancy specialists who manage a long wait list, screen applicants, verify income and eligibility, turn and lease units, collect rent, enforce the rules and do the hundreds of things it takes to manage a large and varied portfolio — many of whose residents come to us from very challenging circumstances. Other staff manages THA’s rental assistance programs, in partnership with thousands of local landlords. THA’s community service staff of caseworkers helps seniors and disabled persons live independently. They help families stabilize after coming to us from homelessness or domestic violence. And they help people succeed. THA also includes finance staff, accounting specialists, asset managers, risk managers, compliance officers, IT wizards, data and policy analysts, program planners, procurement specialists, human resource experts, and clerks. Perhaps most poignantly of all, THA includes receptionists who politely and respectfully welcome needy people who come seeking help that for the most part we cannot give because our housing is full. The work of all THA staff is governed by numerous and exquisitely detailed rules and obligations from governmental partners, funders, lenders, investors, and auditors — as well as important, if less precise, expectations from our community. And they do it in five languages. In this book, you will hear from some of the people we helped and some we turned away. You will also hear from some of our partners. THA does not do this work alone. It takes many people who share THA’s mission and its stake in the health of our City: elected local, state and national leaders, their hardworking staff, public and private funders, lenders and investors, foundation and public program officers, architects, planners, builders, suppliers, construction workers, financial advisors, auditors, attorneys, grant writers, other housers, advocates, service partners, journalists, school district staff, police officers, community groups, unions and neighborhood organizations. They made the first 75 years of this work possible. With their help, we look forward to the next 75 years. Click here to read more of THA's 75th Birthday Celebration Book [PDF]. On August 22nd, 2015, the Hilltop Neighborhood hosted the 2nd annual Hilltop Street Fair, and THA was there to celebrate its 75th birthday with the community. The event was a perfect summer day filled with children, laughs, reflection, food, music, theater, meeting neighbors and strengthening partnerships.